Burglars ransacked a house and stole cash in a raid in the Irish Street area on Saturday night. Police believe the same criminals broke into a separate property but left empty handed a short time earlier. Detectives are appealing for information following the two burglaries at properties in the Waterside area. Detective Sergeant Ray Phelan said: “In the first incident, which was reported to police at around 7.40pm, two men entered a house but left empty-handed. “The second burglary was reported just before midnight. This house was ransacked and a number of items taken, including a sum of money. “We believe that these two incidents are linked and we would like to hear from anyone who was in the area between 7pm and 7.45pm last night and saw a black-coloured vehicle acting suspiciously in the area of Finn Gardens, McClay Gardens or East Avenue. 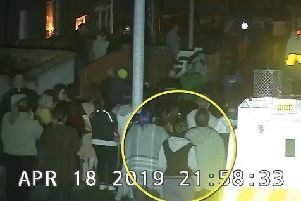 “If you have any information that could help our investigation, please phone detectives at Strand Road on the non-emergency number 101, quoting reference 1272 of 25/11/17.